› Author AffiliationsSupport from The University of Auckland is gratefully acknowledged through the award of doctoral scholarships to M.L.J. and N.Z.B. 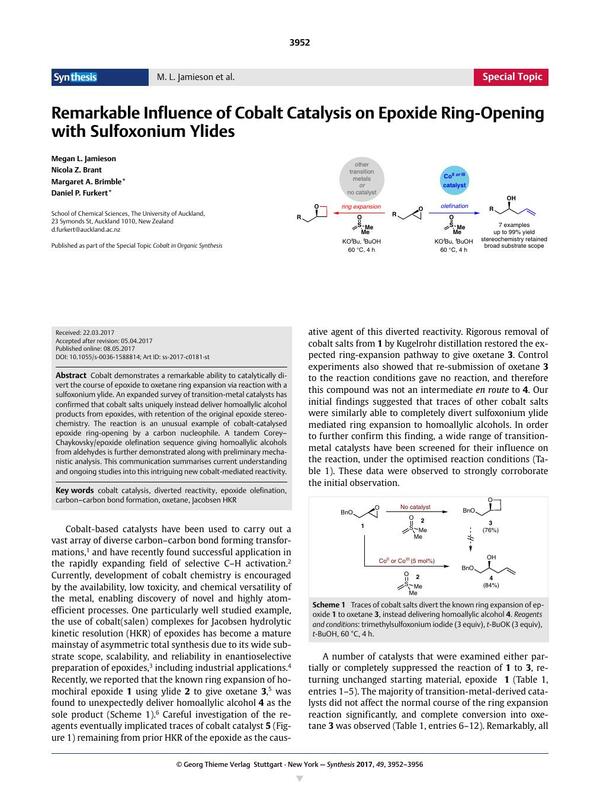 Cobalt demonstrates a remarkable ability to catalytically divert the course of epoxide to oxetane ring expansion via reaction with a sulfoxonium ylide. An expanded survey of transition-metal catalysts has confirmed that cobalt salts uniquely instead deliver homoallylic alcohol products from epoxides, with retention of the original epoxide stereochemistry. The reaction is an unusual example of cobalt-catalysed epoxide­ ring-opening by a carbon nucleophile. A tandem Corey–Chaykovsky/epoxide olefination sequence giving homoallylic alcohols from aldehydes is further demonstrated along with preliminary mechanistic analysis. This communication summarises current understanding and ongoing studies into this intriguing new cobalt-mediated reactivity. 15 Note that all reactions were conducted under anhydrous conditions, which was determined to be important to obtain high conversion in all ylide reactions, see the experimental section for details.